Cool, calm and collected is what Sidath Wettimuny was, one of the greatest opening batsmen produced by Sri Lanka and in my book he was simply the best better than all the rest. As an opening batsman his technical brilliance has not been matched thus far. 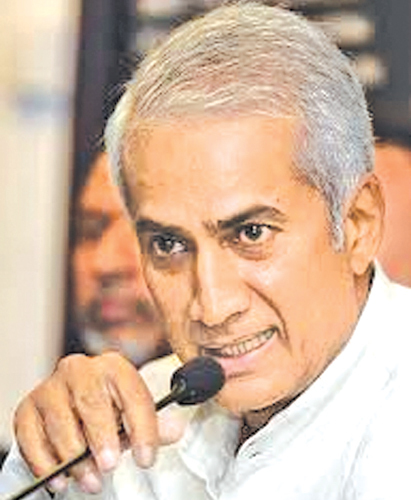 This was mainly due to his late father’s efforts in the backyard of their house down Park Road Colombo 5 which had a turf strip reports suggested. He played for Ananda College and the SSC with distinction. It is no wonder that Sidath was at his very best when he played that monumental knock of 190 at Lord’s against England. Sidath at present is in the advisory committee to look into to the shortcomings of our school cricket. The committee has had two seminars and Sidath has spoken to the school principals, the masters in charge in one seminar and the coaches and the captains in the next. He felt that the capabilities of the coaches were sadly lacking which has become a big problem. He was of the opinion that these coaches were employed by the schools in an ad hoc manner. On the other hand these coaches never had facilities to train and develop. He was of the view that a dearth of quality coaches came about when we won the ICC Cricket World Cup in 1996 and there was a cricket boom in the country amongst the youngsters taking up to the game, and to cope up with this the schools good coaches were hard to find. Sidath stated that all the good work done by Ana Punchihewa went down the drain because he lost the election immediately after the World Cup triumph. This was the time where the rot set in, pointed out Sidath. Today the coaches only objective is to win at any cost and if not they were sacked. This commitee wanted to change the present culture. The budding cricketers should be taught the importance of the spirit of the game. They did a lot of work on batting, bridged the gap by educating the coaches. During the last program batting was highlighted and the mistakes in coaching and in the players, repeatedly observed in kids gave them some food for thought, the committee had to resort to giving solutions via CD’s because to reach out to the vast numbers individually was a far cry. They also had 3 seminars on educating principles on how to promote cricket - this was relayed to the master’s in charge and the coaches as well. At present there are numerous clubs with voting rights only by name, Sidath was bold enough to name two and they were Bohras SC and Liberty CC. Sidath stated that Thilanga Sumathipala was instrumental in this scenario. Sports as a whole has deteriorated to such an extent that we did not win a single medal in the recently concluded Asian Games. Should the Sports Law and the cricket constitution be changed? The Sports Law is relevant to all sports and then there is the individual cricket constitution which can be changed through an Act of Parliament. He was pessimistic that they will do that and pruning the 22 clubs to 12 clubs in the Premier tournament. Sidath stated that somebody should bite the bullet and say that’s it! Top 12 or 10 clubs should play in the Premier. He also emphasized that the old system they had like Sara Trophy, Donovan Andree and Daily News trophies had no issues and they were uncomplicated. The Sports Minister should take the bull by the horns. There is no sustainability in tournaments as they come and go. Arjuna Ranatunga changed our mind set, he was cocky and arrogant which was good and he showed that we can win. Anjglo Mathews is not aggressive enough but Dinesh Chandimal is aggressive stated Sidath. We are never short of talent. Talent is there but youngsters are not ready and should be given time. We have two good spinners in Akila Dananjaya and Sandakan and a good crop of pace bowlers. Sidath is worried about the attitude of players like Niroshan Dickwella who goes to the wicket to score fours off each and every ball. He says that does not work. He also thinks that they should have strategies to every changing situation of the game. Sidath is confident that Chandika Hathurusingha will do a good job with our boys. Coming back to our batting Sidath is really disappointed that our guys are trying to blast their way through the first ten overs like Sanath Jayasuriya and Romesh Kaluwitharana did in the past. Those tactics are outdated now and Sidath said that we need a batsman to last till the end and Chandimal is the only batsman who thinks in that direction. We are decently placed to take our game up noted Sidath. Kusal Mendis is enormously talented although he has his weakness outside his off stump. Sidath said that Mendis and Dhananjaya de Silva have a very bright future. Sidath says that they won’t be getting pancake type wickets which are dead easy to bat however they should also have solid techniques to score runs without gifting their wickets away on seaming tracks. Sidath is of the view that more and more countries should strive to play Test cricket which is good for the game.